Super Hero Boy: Better than saving all those Box Tops! Better than saving all those Box Tops! I've been an avid saver of Box Tops for Education for years. Now that I have my own son it becomes more and more important for me. You might remember me talking about my obsession with saving Box Tops for Education a few months ago. Well since I realized you could convert a good majority of your online purchases through the Box Tops for Education Marketplace I've been coming up with new ways to donate. The Box Tops for Education Marketplace is fabulous, just log in and click through to your favorite stores and a percentage of your purchase, listed beside the stores name, is given directly to the school of your choice. I've gotten into such a habit of buying things online after gas prices jumped that its really rare for me to visit a store directly anyways. So being able to buy what I need online and give to the school I want is a huge bonus. Some of my favorite stores are listed with Box Tops for Education including Barnes and Noble at 6% donation, Gap at 2% donation, Discovery Store at 5% donation, and even quite possibly my favorite store of all time Pottery Barn with a 3% donation. All you have to do is log in, click through to your store, purchase whatever it is you wanted to buy, and without any extra help from you your donation will go directly to your school and it doesn't cost you a single penny! I was recently given the chance to try out the program with Barnes and Noble. I ended up picking up a new movie for our bluray collection and a toy train for Connor. I know that doesn't sound like much of a "book" purchase but have you seen the great things that Barnes and Noble sales lately other than just books? You can find some of my favorite toys including wooden puzzles, train sets, board games, cds, dvds, gift ideas, and of course amazing books. Connor is loving his little train and its a great addition to our new train collection. Another neat idea on how to ear Box Tops for Education dollars is you can log onto your Box Tops for Education website and even print store coupons you can use on your groceries. For each coupon you use you donate to your school! Seriously how awesome is that? With the economy down and money tight these days I can't tell you how much my family relies on coupons lately not to mention the fact that just using coupons to help my school of choice is amazing. America may just be the greatest nation on the planet but our schools are seriously falling behind due to lack of funding and budget cuts. Every little bit you can do to help will make a huge difference. I actually got some money to buy new kitchen table chairs for Christmas and I'm going to buy them through Target and click through my account at Box Tops for Education to donate 1.5% to my school! 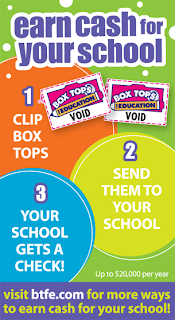 Check out Box Tops for Education and remember if you don't have a specific school in mind to give to you can just pick a school in your area to donate to. I've been giving for years and even though Connor has a good four years before he will be in school if I can help improve them now all the better! i have been saving boxtops for years. i send them to the school i graduated from. Its K-12, all in one building. And my daughter will graduate from there as well.